Bandcloud 201 This one ended up largely focusing on creepy noise. I just can't help myself. Naturally I was drawn to this on account of its super-weird artwork. The music is similarly unhinged. It's clanky and droney and a bit synthy. You've got whirling noise, industrial clamour and chilling nocturnal sounds, particularly in the lengthy 'Ghost Walks'. Which feels like an uncomfortable wander through a haunted forest at night. Spoopy. 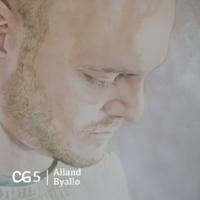 Alland Byallo was asked by Canned Goods to make a mix of non-dance music, so he put together this selection of "music i listen to while working on my design/visual art". It's a fascinating tread through his influences and interests, from Laurel Halo and Huerco S to Bogdan Raczynski, making room for Aught's Xth Réflexion and some Equiknoxx along the way. Eighty minutes well spent. It feels like Dark Entries is a big enough prospect that they don't need me shouting their praise but this release is something special. Hard to describe, it's like minimal meets electro. On top of the two exceptional originals we have two remixes 'State of Mind', one from LA-4A and another from Noncompliant. The former is an acid-drenched electro workout while the latter is a sizzling future-techno throb. Jay Simon has been collecting old Bmore records and he's put together an hour-long mix featuring a bucket-load of tracks. I'm talking 30+, and I honestly recognise one (a Rodd Lee flip of a Mobb Deep track). He flies between pop reworks (Art of Noise, MJ) and weird beat cut-ups, traditional tropes rendered new and exciting. This is more than just 'Think' and 'Sing Sing' breaks, believe me. I'm not sure who Sargasso Sea is/are, all I can tell is that they're Canadian and they've put out some tapes on Korea Undok Group. This one lands on Summerisle, and its cover is a typical 70s lecture hall. I guess that ties in with the track entitled 'Health Sciences'. It's a fervent collection of murky noise, part slow dread, part industrial stomp. I'm keen to learn more, though it's nice to imagine a nameless person or persons creating these strange sounds in a weird vacuum, the 'Fantasy Winnipeg Square' of the opening track's title. This is a really interesting compilation that features women of all ages, generally working in the experimental sphere. Dawn Tuesday, who's featured here before, has the opening track, and that's how I came across the release. Many of the tracks are what you'd term dark ambient, others are strange electronic workouts (see Tantroniq's 'Numbers'). For me the standout entry is Candy L's 'Cead Mile Failte' (that's thank you in Irish), a weird passage of sound that's part new-age journey, part folk lament. Thirteen minutes of gentle beauty. It closes with a 40-minute chunk of muted ambience from ʞu¡0ɹʞS called 'Casta diva' that's both beguiling and hypnotic. Mr Mitch recently shared his Peace Edit of Corona's 'Rhythm of the Night', a lurching chug of syncopated stabs and soft piano meeting electric guitar plucks. Here Jasmine Infiniti has paired it with Mobilegirl's gorgeous 'Ice Sheets', a kind of dembow lullaby. The combination works so well I could hardly believe it was a blend. At six minutes, it's too short I think. I could listen to it all day. I'm in Serbia right now. Where are you?